Suzanne grew up in Richardson Texas with her sister and two brothers. She learned from her parents that everyone can make their dreams become reality, and that life is a combination of luck and skill. She began to dream big at a young age and feels extremely lucky in this life being the mom of four incredible children. Immediately after graduating from high school, Suzanne was discovered and left for Paris to pursue her modeling career. She traveled around the world living in Tokyo and Milan, and then ultimately moving to London with her former husband. All of these amazing cities sparked her creativity. After eleven years in England, Suzanne moved to Santa Barbara where she lives with her husband, Phil, her best friend and inspiration. She believes that anything is possible and loves the idea of "what if?". Somewhere out there in the galaxy, a dark and evil force is waiting to annihilate humankind... and through the millennia, its purpose has been successfully averted. But its efforts never stop. The Awakening: Fate in Motion is a story of aliens and their part in our history, and how since the beginning, we have been protected by enlightened beings from the dark force, Sar. It's a story of good vs. evil. Sar is coming... again. People who are unaware of their destiny suddenly find their lives changed as they are awakened to protect Earth from this evil force that wants to end the world. Plots are uncovered and old secrets are revealed to the chosen ones who need to fight off this evil force once again. They have no choice. Their fate is written in their genetic code. And it's now in motion. It's astounding that The Awakening: Fate in Motion is Suzanne Boisvert's debut novel. Right from the opening scene, I was hooked... by the flow of words and the way the author effortlessly introduced the characters and laid out the plot. Boisvert has a way with words. Her writing is fresh and unencumbered, the words flowing out of the pages and drawing me in. A hidden journal by the American president, FDR, confirming the presence of the aliens and their purpose, was gripping. As I turned the pages, I was excited to see what the author would come up with next. What other conspiracies are in play? We have a history we do not know, and I believe that. The author fed my fascination with this topic. Sci-fi fans and those interested in esoteric knowledge will have so much fun reading this book. I look forward to more titles from this author. Highly recommended! The Awakening: Fate in Motion by Suzanne Boisvert introduces us to Sar, exiled from earth thousands of years ago and hiding out in our vast galaxy. Sar is not waiting in silence, however; he has found a way to manipulate the darkness that lingers within humanity, controlling anyone he can to find a way back in. Lanie found herself rising high to top the music charts but even that fame could not fill the void and the darkness she felt within. When she finds herself locked in a strange hospital with no memory of how she got there, a deeper truth begins to reveal itself to her. If you want a book that has amazing elements of intrigue, the supernatural and more twists than a braided pretzel, you are going to enjoy The Awakening by Suzanne Boisvert. It is not every day that you find a science fiction story with so many different layers. The pacing of this book can be a little slow at times, but personally, in this instance, I found it needed to be that way so you could take in everything. There is a lot of information to absorb about the world created in this book and the author makes sure to not only give you the details you need but the room to breath and take it in. Lanie could be any young starlet today (at first), who seems to have everything, but when you scratch the surface you see how much of a fishbowl being famous really is, and then of course Lanie is really so much more than just a starlet. I don't want to give too much away but I promise you this book is one that will keep you riveted to it. All of the characters are fully fleshed out and complex, and the story itself is very well told. I even found myself liking Agent Sinclair, and I don't normally like CIA agents. This is a recommended read. Singer-songwriter Lanie Montrose, therapist Dr. Suki Carter, and CIA agent James Sinclair are connected to each other through their otherworldly lineage. An evil being named Sar is waiting on the edge of Earth’s solar system to find his way back to the planet while manipulating others to do his evil work. The Awakening: Fate in Motion by Suzanne Boisvert is a sci-fi fantasy that tells the story of Earth’s ominous fate unless the chosen ones do something about it. The Awakening is certainly a plot-driven story but by no means lacking in characterization and character development. The protagonists are memorable and have good depth. I gravitated more towards Suki Carter, who’s much more level-headed to me compared to Lanie and James. The antagonists are also well-fleshed out and have understandable motivations for their actions. The clean prose and straightforward narrative alternate between a number of characters’ POV. Boisvert handles the narrative threads well before everything is connected and converges towards the finale. There are enough suspenseful and exhilarating scenes for action fans. Realigning several historical facts to fit the alien conspiracy is exaggerated in some parts but it works. The best moments in the book for me are when the chosen ones realize and utilize their special abilities. The Awakening put a good spin on the alien theme, with the aspect of rebirth making it a slightly different read for the sci-fi fantasy genre. I like the ending and how the hint of a sequel is seeded into it. All in all, this is an entertaining read from Suzanne Boisvert. An ancient foe, one banished from Earth thousands of years ago, is about to return. For thousands of years, he has controlled government leaders and influenced the fate of humanity in mysteriously dark ways, and has finally found a way to return. No one has a clue what his return will signify, but strange things are already happening. Lanie Montrose, a famous musician, finds herself in a strange hospital without knowing how she even got there, and then there are memories linked to a powerful enemy. Dr. Suki Carter is just about to discover that her patient, Lanie, is someone other than who she claims to be. A CIA agent, James Sinclair, finds his destiny invariably connected to the discovery of a strange journal and wonders if the stories from his grandmother are more than conspiracy theories. The world is about to change with the return of Sar, and will anyone or anything ever be the same again? The Awakening: Fate in Motion by Suzanne Boisvert is a strong offering as a sci fi novel, convincing and filled with unforgettable characters, with a setting where two worlds intersect and where the mysterious past collides with the present. Suzanne Boisvert expertly keeps her readers longing for more, thanks to the masterly use of suspense and the sense of mystery that permeates the narrative. She skillfully blends mystery with the supernatural and creates scenes that are filled with intense action. The cast of characters is exceptional. I loved the fact that each character seems to have a unique story, but then everything culminates to a point of intersection, with the tension growing as well as the conflict, escalating into a satisfying denouement. The Awakening: Fate in Motion is fast-paced and hypnotic, a powerful showcasing of this author's gift for prose, plot, and character. The Awakening: Fate in Motion by Suzanne Boisvert is a gripping tale that captures an event about to change the fate of humanity — the imminent return of a malicious power that had been banished from Earth for thousands of years, “the one called Sar... influence of Corin.” While it might have sounded like myth, his presence is felt even more strongly as the days pass. He has been hiding and controlling the darkest part of humanity, and now he has decided to re-enter the scene and no one knows what his plans are. A cast of compelling characters is introduced into the narrative, people under a powerful spell — a successful musician with secrets she is barely aware of and links to an ancient power, a doctor navigating a dangerous path, and a CIA agent who makes a startling discovery. Things are about to change and the clues are multiplying by the day. But can someone stop the inevitable? Suzanne Boisvert’s novel is stellar and the complex nature of the plot is among the elements that make the story a must-read. Boisvert creates subplots and weaves a backstory into the narrative that ensures the suspense is strong and inescapable. Her prose is exquisitely good and it features powerful descriptions that give readers vivid images of the setting, allowing the emotional development of the characters to take a steady course, making them multi-dimensional. The dialogues are skillfully written and reduced to what is necessary while the economy of word makes the narrative a delightful one. 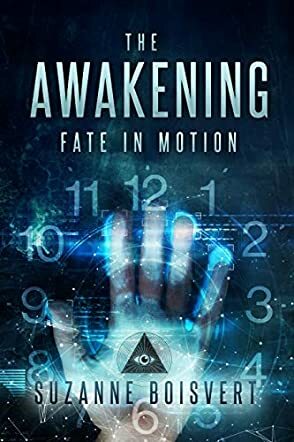 The Awakening: Fate in Motion is a great read with characters that are memorable and extraordinary, a fast-paced, gripping plot, and a conflict that makes readers follow the story to its explosive climax.